With the school summer holidays finally here, are you wondering how to keep the kids entertained for six weeks and what the impact on your bank balance is going to be? There are many places to start when thinking of ways to minimise school holiday stress and ensure the holidays are as enjoyable for you as they are for the kids. For free and cost-effective activities local councils are great place to look. Use your local authority’s website, notice boards or listings and social media platforms, such as Twitter, to find local events and activities planned for the holidays. Despite the sunny start to the summer, there will be times when you will have to take your plans ‘in-house’ and this is where having boxes of tricks to hand is useful. Craft boxes, dressing up boxes and even a smart TV box can minimise the risks of wall art and “I’m bored” chanting. Roku is a tiny streaming player designed to play on-demand and online content instantly to your TV without the need for a PC. The box adds the functionality of a Smart TV to any “dumb” TV and offers music and games in addition to films and TV content. As well as being able to access Netflix (with great children’s movies and TV programmes), BBC iPlayer, Sky’s Now TV (including Sky Sports) and Spotify, there are over 300 channels to choose from. You can sometimes get a free month’s trial of paid for subscriptions from services such as Netflix, so it is worth looking out for new subscriber offers. There are two models currently available, the Roku LT and the Roku 2 XS, which has a motion-controlling remote -- similar to the controller that you get on a Wii – for playing games. 1. On-demand entertainment – don’t panic when there is nothing on TV to watch, with Roku’s library of streaming content, the choices – for the kids, you or the whole family -- are endless. The most popular kids’ films currently on Netflix include Cars 2, Up! And Justin Bieber Never say Never. Or watch CBeebies and CBBC shows on-demand including Waybuloo, Charlie and Lola and Project Parent. 2. Music – no more square eyes, listen to your TV instead of watching it. With the ability to stream music, search online radio channels and playback on-demand radio shows, you can choose what you have on in the background while being more creative with the kids and picking Play Doh out of the carpets. Check out the ‘Absolute Kidz’ playlist or stream the Kids Dance Party album through Spotify today. 3. Games – an obvious favourite for children. You don't need to splash out on a costly game console and video games that may not be appropriate for younger children. With the Roku 2 XS kids can play casual games like Angry Birds on the TV using the gaming remote -- so you can have your smartphone back. 4. Cooking – with plenty of cooking channels from baking to vegan, you can cook along with the kids step-by-step and with both of you following the recipe on TV it helps to hold their concentration. iFood.TV have a dedicated Kids Recipe channel with hundreds of ideas ready for you to try, or catch the whole series on ‘I can Cook’ kids TV show on BBC iPlayer for free. 5. Exercise – parents get enough of this spending six weeks running around, but do the kids get enough exercise on those rainy days they spend in front of the TV? With Roku they can literally exercise while watching TV and if you've over-indulged thanks to the cooking channels you could join in too! We recommend ‘’Sing and Dance with Barney and Friends” on Netflix. 6. Education – trying to maintain some level of learning while they aren't in school? Try some ‘edutainment’. From on-demand mainstream kids shows that have embraced this method to more complex language teaching and multilingual channels, education doesn't need to be obsolete during the holidays and you don't need teacher training. Check out the popular ‘Jack and Holly’ channel, launched recently by a Norwich couple who desired more genuine educational material for kids and parents to enjoy. With all this to go at the summer holidays really should be a breeze, although if all else fails just remember…there are always the grandparents! The Roku LT is the lowest cost option from Roku at just £49.99, or if you want extra features including full 1080p HD and enhanced gaming capabilities, the Roku 2 XS costs £99.99. 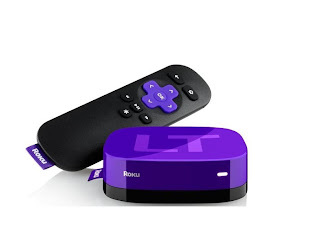 The Roku LT connects to your internet instantly via WiFi so you will need an active broadband connection and a wireless router. The Roku 2 XS has an Ethernet port to connect your player to the internet (in addition to its ability to connect via WiFi) as well as a MicroSD slot and USB Port. my FACEBOOK page now where you can.